I found out about Readercon through Lunacon‘s program book (these cons seem to advertise at other cons), and since it was relatively near me (4 hours away isn’t too bad), the husband and I made a weekend road trip out of it – leaving Friday night and coming back Sunday afternoon. Husband spent his days on his bike and watching the Tour de France, I spent my days at the con. Unlike Lunacon, this was a convention that was distinctly all about the books, so everything in the program was on a bookish track, although I did see some panels that looked to be more for writers, and some panels that were more for readers (there was overlap of course). I went for the panels that interested me as a reader. The first cool thing after registering was that I got to meet Chelle from Tempting Persephone! Oh so very lovely in person, she was. We got to spend a good chunk of the day together, and it was really nice to have someone else to go to panels with and talk to about what we sat in on. Here are the panels and readings I went to. CAVEAT: I didn’t take any notes and it’s been a couple of days so these are going to be simple overviews of my general impressions. I was planning on posting to my blog, but I took a casual approach and just enjoyed what panels looked interesting without any real blog-y agenda. Book Learning (Gregory Feeley, Kathleen Ann Goonan, Katherine MacLean, Kathryn Morrow (leader), Ann Tonsor Zeddies) – This was a panel discussing a 2008 article in the Guardian by James Wood about the nature of characters in books. I hadn’t read this article prior to the panel so I was a bit out of the loop for some of the discussion, but it was interesting. They talked about the idea of flat/cardboard characters versus well-rounded characters, and it wasn’t what you would expect. It was more about whether someone’s idea of well-rounded or flat was valid. At one point they talked about if people in real life ever grow or change. It was a very different approach than I as a reader take because I do like characters that feel like they have more depth (well my idea of depth that is). Felt like an interesting window into writing, and how some “flat”, “one-note” characters are used in the story versus characters that “grow” or “change”. (Here’s the link to the Guardian article). [Interlude] This is where we popped over to the dealer’s room (aka Heaven) and wandered for a bit and had lunch. Un/Orthodox Genre (Jeanne Cavelos (leader), Michael Dirda, Yves Meynard, Robert V.S. Redick, Peter Straub, Gary K. Wolfe) – This was a panel about genre conventions. The jumping off point was about how some books fit squarely into a genre, and other books don’t seem to quite fit inside a genre and that on one hand Lev Grossman says “Conventions aren’t a prison that genre writers are trying to escape” and the other Peter Straub: “I dislike the sense of necessary limitations lots of people go for. I don’t want to live in a dollhouse”. The talk sort of flowed around writing and working with conventions. What conventions were, how to write something original if you have these conventions, approaches by different writers and so on. I liked the way this one was organized, with questions from the leader and everyone in the panel putting in their two cents. Another interesting panel. My opinion as a reader: I always love the books that tweak at genre conventions or straddle more than one genre. The City and the Strange (Leah Bobet, Amanda Downum, Lila Garrott (leader), Stacy Hill, Ellen Kushner, Howard Waldrop) – This was a really well attended panel. The room was packed and there were people standing because they were unable to get seats (and this wasn’t a small room). Definitely the most popular panel I went to at this con. This was a panel about worldbuilding, and specifically: cities. There’s the cities that are completely made up, and then there are the cities in contemporary and urban fantasy that do exist in our world, and then, there are cities where magic is out in the open, and cities where the strange is hidden from plain sight. With the books that try to capture real cities the panelists discussed the difficulty of capturing the essence of a place so that a local would recognize it, and how it’s difficult (if not impossible) to do that because everyone sees a place in a different way, but that if a book is set somewhere, a writer should try to add something to the story that is from that place, otherwise if you don’t remember what city the book is, what was the point? There was a discussion of why cities, how urban fantasy differed from rural fantasy, the idea of neighborhoods within cities, and collaborative cities (the Borderlands). I went away really wanting to read the rural fantasy Wide Open by Deborah Coates. [Interlude 2] This is when Chelle and I had to say our goodbyes. There wasn’t much else I wanted to sit in on (and I was pooped with being in a crowd) until 8pm, so I went back to my room, read and relaxed and had dinner and then came back. Book Covers Gone Wrong (Daniel Abraham, Liz Gorinsky, Caitlín R. Kiernan, Katherine MacLean, Lee Moyer (leader), Jacob Weisman) – This was a panel about book covers. It had 3 authors, a couple of people in publishing, and a cover artist. The panel began with everyone contributing their own horror story that had to do with a book cover. This ran from covers that had NOTHING to do with what was in the book (the biggest complaint), to 6 different fonts used, to arguments with the publisher, to the blurb from George R. R. Martin being extremely small and hard to see. On the publisher’s side there were the problems of time constraints and artists just not producing something that they wanted. I laughed so much during this panel, especially when Lee Moyer passed around some bad covers he’d printed out from the internet and when members of the audience brought out their examples of bad covers. A lot of the examples where just really CAMPY and dated (aka, so bad they become good again). Dancing Around Time Travel. Athena Andreadis, Grant C. Carrington, Helen Collins (leader), John Crowley, Jeff Hecht – This was the brainiest of the panels I sat in on. There was some discussion about how time travel was basically impossible (one thing everyone seemed to agree on). So everything that has time travel in it could be, it was argued, not really Science Fiction, but instead Fantasy. And then there was discussion about if you were to put time travel in a book, how would you do it. A couple panelists said you could get yourself into trouble if you added too much science to the story and this can date it, and there seemed to be a few people in favor of putting as little explanation of time travel as possible and moving on (don’t look at the man behind the curtain). There was also a lot of science discussion (about what time actually was and how it behaved) that was fascinating but I couldn’t repeat it here even if my life depended on it. Sunday was a shorter day (I think programming ended around after 3pm) and I had to drive back to New York, so I only went to a couple of things before we had to check out and be on the road. Uncanny Taxonomies (Daniel Abraham (leader), Ellen Datlow, Caitlín R. Kiernan, John Langan, Jeff VanderMeer) – This was another panel about categorizing of books, but instead of the constraints/conventions of a genre, this was more about the idea of labeling books as being this versus that. There was a lot of discussion about the need to put books into genres, and since there were a lot of writers in this panel, there were comments about the writing process and how they don’t set out to write IN a particular genre, they write the story and then it gets placed somewhere. There was some discussion on how different books placed within the same genre could be and what makes a book put somewhere like in science fiction instead of literature. Kiernan commented that she would like to see everything just shelved by author instead of genre. 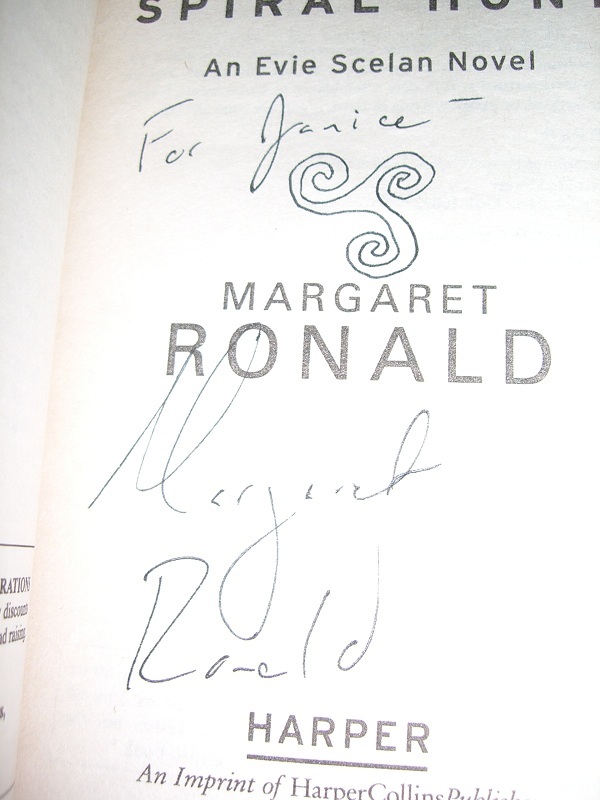 Reading: Margaret Ronald – So this was the ONE and only reading at Readercon I went to (and in hindsight I think I should have gone to more), because I had read and liked the first two books in Ronald’s Evie Scelan books (I have reviewed them both here). Book three is on the TBR (I spent an hour looking for this instead of packing on Friday and never found it. I bought another copy). This reading was from “The Governess and the Lobster” from the online webzine Beneath Ceaseless Skies. The story can be found online here. It was delightful – a steampunk story about a city where some automatons have gained awareness and live side by side with humans. In this story a governess has just been assigned to the Cromwell children, who do things like hand their governess jars of spiders and mechanical lobsters. 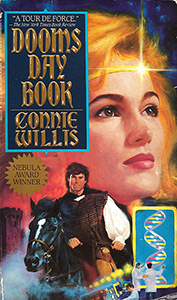 From what I could tell there are other stories set in this world including one about a brain in a jar? And a Professora? There is a book written about this Professora, but no news on a publish date yet. I would like this book please Universe. 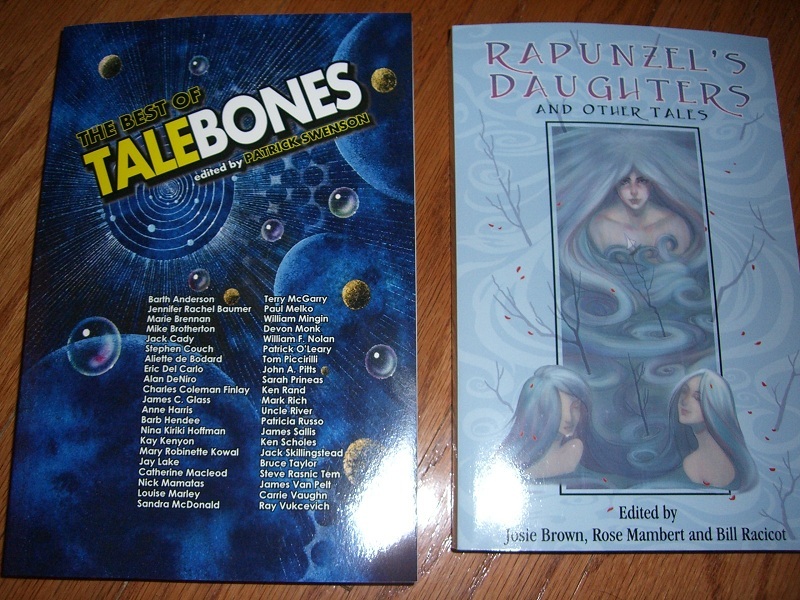 Picked up at the dealer’s room: The Best of Talebones, edited by Patrick Swenson (I recognized a lot of the writers in the anthology so I was curious to give it a go) and Rapunzel’s Daughters and Other Tales (what happens after the Happily Ever After of fairytales – I was sold on just the description of the Rapunzel’s Daughter story – about her daughters that inherited her uncontrollable hair and the consequences of this attribute). 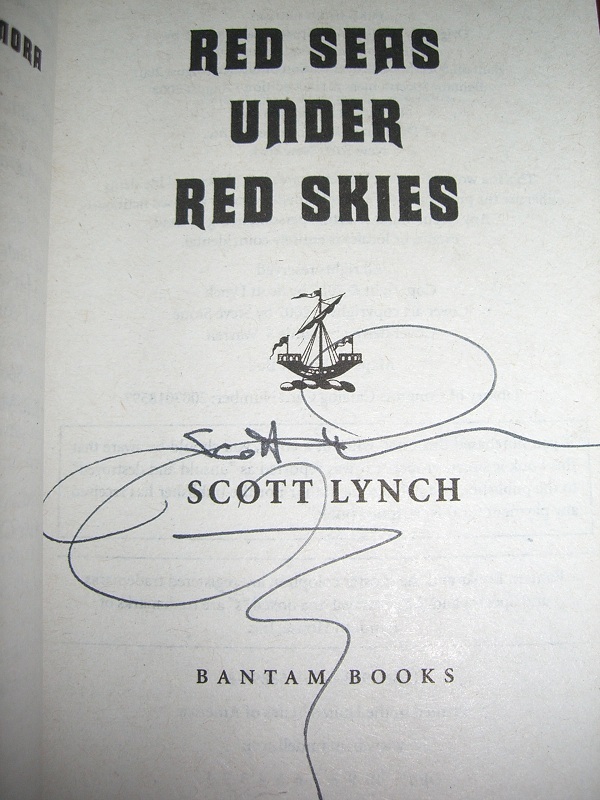 The Husband wanted his copies of his Scott Lynch books signed but we missed the author’s signing and reading on Friday and I still don’t understand how Kaffeeklatsches work, so I was happy I found a signed copy of Red Seas Under Red Skies in the dealer’s room. 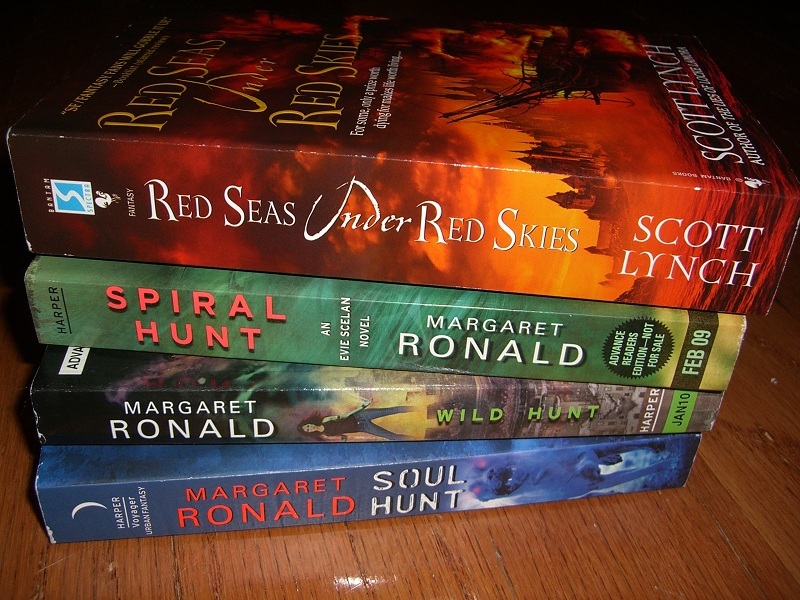 The other three books are my copies of the Evie Scelan books (Soul Hunt bought at the dealers room). Not pictured: the signed hardcover of The Outback Stars by Sandra McDonald that I bought. 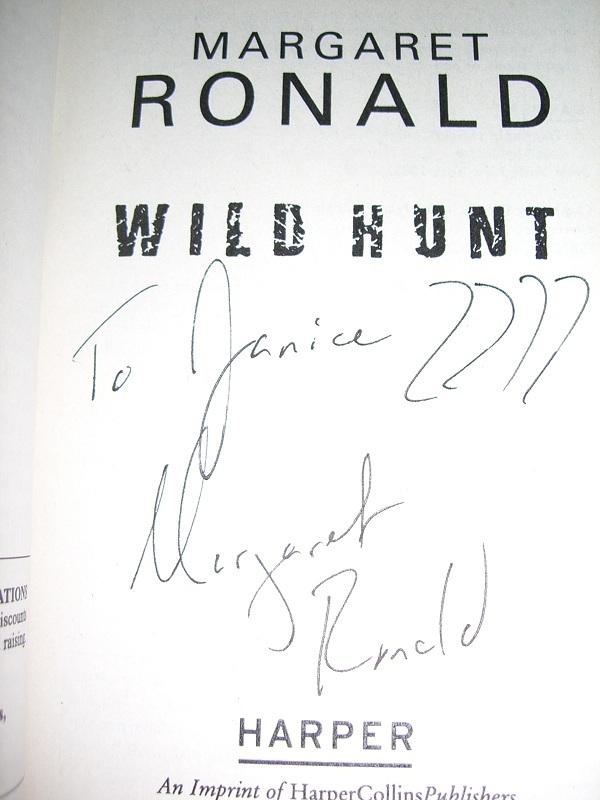 I forgot to bring my personal copies of Sandra McDonald books to Readercon! Next time maybe I’ll bring them and try to get them signed. Lurved The Outback Stars. My favorite! 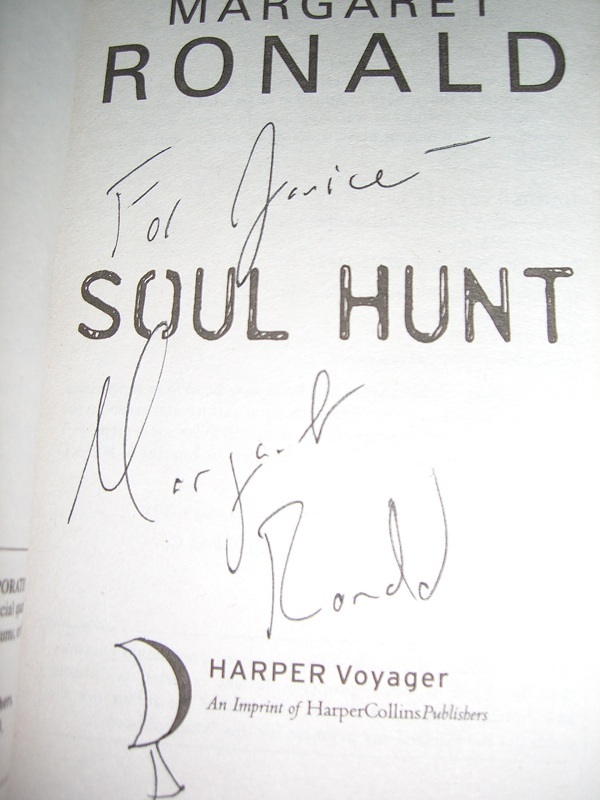 This entry was posted in events and tagged margaret ronald, readercon, sandra mcdonald by janicu. Bookmark the permalink. But I’m torn because I suspect more of the bloggers I want to see will be at BEA. The books, authors, and panels I want to see are at Readercon, though. I didn’t feel that rushed over the weekend, but yeah, driving back and forth for it takes a lot out (and I wasn’t the one driving). I stayed at the hotel which was a good call I think (because I could scurry back to my room whenever I wanted – I wish there was an option like that at BEA). Yeah, definitely more bloggers will be at BEA, and you can tell who they are by their badges (at Readercon, everyone who wasn’t an author or dealer had the same kind of badge). On the other hand, Readercon was so much more about Science Fiction and Fantasy which are genres BEA isn’t so intense about, and it’s a lot more about the books and stories themselves than it is about the latest trends, marketing, and networking. Very different styles of con. It’s about 4 hours away for me as well so I was also thinking about the trip there and back when I said rushed. Just going for the weekend doesn’t seem long enough if 8 hours of that is just getting there and back! How far away is the hotel? I really like the idea of a con that is about SFF and is more about the books and stories than marketing and trends so I’m definitely considering it. If not for all the bloggers who go to BEA, going to Readercon instead would be a no brainer. For some reason I thought you were closer. OK, that makes sense. 4 hours is a haul. The con is hosted at the hotel itself (Marriott – it’s actually a really nice hotel, I was quite happy with it) – link to the info. So all I had to do was climb a flight of stairs into the lobby (my room was on level 2 which was below the lobby), and walk past registration to the con area. It was highly convenient! Also I love how high the air conditioning was with how hot it was that weekend. Oh, bring a light jacket if you ever go by the way. Some rooms are chillier than others. This is a fantastic recap of the con! I can’t believe how well you managed to nail down everything that happened in the City and the Strange panel in that paragraph. I mean, I realized there was a lot of discussion happening among those panelists, but…wow. That’s a lot. RE: that genre panel, I appreciated how articulate the majority of the panelists were. The two gentlemen who bracketed Straub were particularly adept at expressing their points of view, and made some interesting observations, I thought. Also, you are very kind. 🙂 The highlight of the con for me was definitely getting to hang out with you. When we meet up again, it’ll be even better (as my introverted self won’t feel the same nerves). Thanks for spending the morning with me! Ha, I was just rereading what I said on the City and Strange and wondering if I made any sense! So thanks. There was really a lot of discussion at all these panels, maybe I SHOULD take notes, but I don’t know, I am a lazy one. I always tell myself “Oh I’ll remember”, and then I don’t really. I saw people taking notes at some of these and I really wonder what happens to these – I guess they are writers taking notes for their craft? No idea. Too shy to nosily ask, as much as I secretly want to. I DID take notes when I went to the Books of Wonder event yesterday though, so I will have a good detailed post on that soon. You didn’t seem nervous to me! 🙂 I really liked spending the morning with you. We should do it again, and maybe Kristen (see above) will join us next time. It feels a lot better when you go to these things and already know someone, for sure. Thanks for the panel writeups! I wasn’t able to attend any of those. I’m so glad that you and your husband were able to make a weekend of this one (even if he didn’t attend the event with you :P). Some of these panels sound fantastic! I would have loved to attend the genre discussion, and I’m with you that I enjoy when books tweak or straddle genre boundaries. 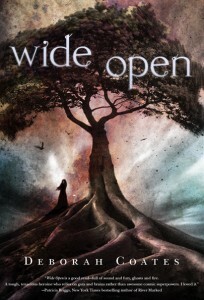 I’ve had my eye on Wide Open as well, so I’m excited to hear your thoughts on it if you do read it soon! I saw you Tweet about the covers gone wrong panel while you were there, but I think the time travel one is the panel I’d most like to attend. I have to say I disagree with time travel being fantasy rather than sci fi though…I think it can be either, depending on the mechanics and the book. Thanks for the recap! Oh the time travel panel was so fascinating and I loved what Athena Andreadis had to say in particular (she was just really impressive and articulate on the subject). Yeah–if we can only call things that are scientifically possible science fiction it just becomes way too strict. I can’t believe people would say Star Trek isn’t Sci Fi! Maybe some of these people should have attended the genre panel. =) I like that some things can be BOTH…like I’d say Star Wars is both Sci Fi and Fantasy, but like you, my definition isn’t so stringent.